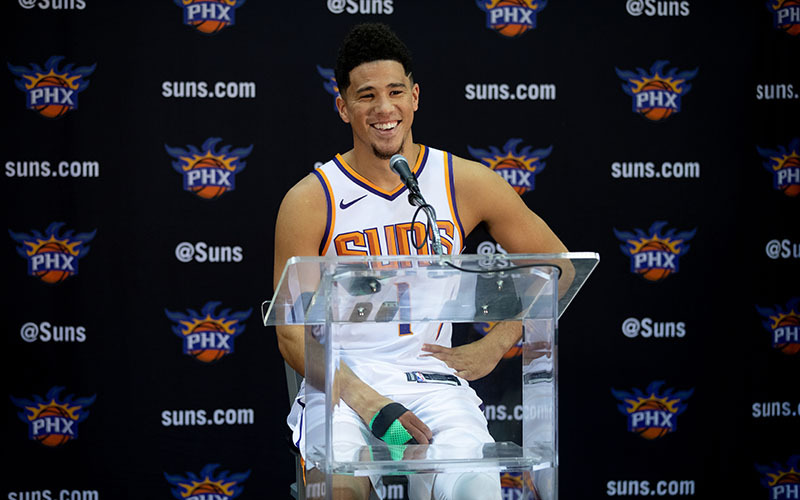 PHOENIX — The expectations that come with being an NBA Draft lottery pick are something Devin Booker knows all too well. Selected 13th overall in the 2015 NBA Draft, the fourth-year wing has developed into a cornerstone of the Phoenix Suns franchise. However, it was at times a painful process. In his three years, Booker has not experienced a winning season. The Suns have a combined 68-178 record, bottoming out when they won only 21 games last season. That led to an opportunity. 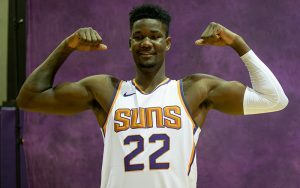 For the first time in franchise history, the Suns had the first overall pick in the draft and selected center Deandre Ayton, who spent one season with the Arizona Wildcats. Ayton makes his NBA debut Wednesday, and Booker’s goal is to help the rookie experience a memorable start to his career, minus the losing that Booker endured. “It’s the start of his legacy,” Booker said. “My job is to make it special for him and not make it like my first three years. Booker’s earliest seasons were highlighted by earning first-team honors on the NBA’s All-Rookie Teams, becoming the youngest player to score at least 60 points in a game when he poured in 70 against the Boston Celtics in March of 2017 and reaching 4,000 career points faster than any player not named LeBron James or Kevin Durant. But the statistical success did not translate to an improved team record. For Ayton, his desire to win is evident, but his first taste of professional basketball will also serve as a learning experience. The 20-year-old’s emotions are riding high ahead of the team’s season-opening game against Dallas and the third player taken in the summer’s draft, guard Luka Doncic. Despite his age, Ayton’s role mirrors that of a polished veteran. Coach Igor Kokoskov has entrusted Ayton to protect the rim and be a vocal presence on defense, responsibilities he was not accountable for at Arizona. Though it is safe to assume future All-Star selections and further league-wide recognition are waiting in the wings for Booker, the shooting guard wants his next step to involve winning. According to him, there are no excuses for not doing so. “Can’t say young team,” Booker said. “We have a lot of veterans around. Still young players but every team has that.